Baltimore Medical System (BMS) is building a Healthy Living Center in Highlandtown on a City-owned parking lot. From the lifeless asphalt will soon rise a LEED Certified building, housing a LEED Platinum community health center. 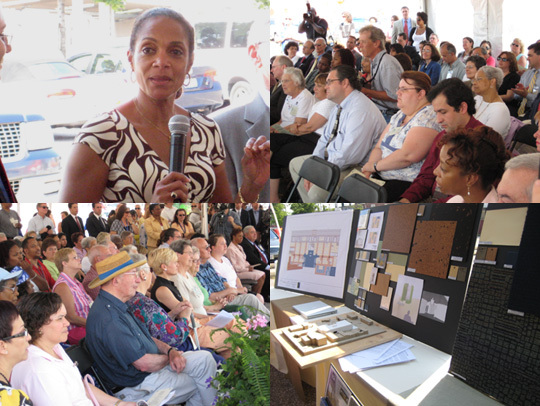 On Friday, June 13, we went to their groundbreaking ceremony, which was both heartwarming and well-attended. Twenty-three years ago, BMS began providing quality primary health care to the citizens of Highlandtown, many of whom were elderly and wished to age gracefully in their own homes. Today, BMS provides care to 14,000 people, including traditional east Baltimore residents, as well as new refugee and immigrant patients from around the world. This new center will continue to provide the full range of health services for all people, whether insured or uninsured. The new space will allow BMS to increase their patient base to 21,000 and to provide educational programming such as smoking cessation, prenatal classes, and healthy eating in a new community room. As it increases its staff, it will continue to be the largest employer in Highlandtown. BMS is dedicated to helping people live healthy lives, and they are committed to a building that reflects this mission. This will be a place that provides a healthy and healing environment. They want the building itself to be good for the earth and for all who use it, to demonstrate how our physical environment is so important to our health. In addition to environmentally friendly building materials, lots of natural light, and a terrace healing garden, there will also be art by local artists made from recycled materials. Its location on Fleet Street, a formerly bustling main street of the neighborhood will help renew that area’s vitality. It was so uplifting at the groundbreaking to see how much our local, state, and federal representatives support this organization and this project. The mission of BMS to provide quality health care in such a beautiful setting to those who need it most gives us hope for Baltimore’s future. Why not build one of these in every neighborhood in our city?